Sayonara... - Page 4 — Welcome to the GameSalad forum! It didn't work for me on iPhone 5S too. it works with mouse position inside behaviour, actors are reacting instantly. Do you have any idea to use it like touch pressed? Try this on your device, not on the preview. It works on iPhone 5S, 6S and 7. They are posting now again, new version is out, so this is a good time to write them through the blue chat bubble icon! They're back from holiday for sure, no guarantee they'll actually reply. (b) they're so busy fixing it they cant respond. My message hasn't been "seen" yet either. Hopefully, fingers crossed, today could finally be the day... that aliens come to enslave the human race. Somehow I feel that's actually more likely. They dont respond to me also whatsoever. This is the worst company with the worst support I have ever worked with. Leaving paying customers in the dark. I think Im going to send them a message everyday till they respond . @unbeatenpixel - Not had a chance yet mate, as I have to build it and upload to apple to test, or maybe on Android, that's easier (as GS preview on device doesn't work me, so I'll have to merge and build it...) is it showing a fix, or the problem mate? Workaround. I applied it to my own games. It works on the device. I'll give it a try - I can see it's not acting on clicks unless the mouse position has changed, so just wondering why this works for you - So, it also 'fixes' instances where you need to actually click the button, if using that behaviour instead? - Also, I have buttons that can be pressed and held (power-ups) etc, enabled/disabled flags, etc, so I'll need to re-jig my logic a bit , but it's appreciated if it's a possible workaround for my game! Mine. After saw this topic, I noticed that my own games suffer(Minimal, 20Sec, Wordg..) from the same problem. Some of them were critical buttons. The odd thing was that there was a live version working flawless. So what changed? To support iPhone X, I only changed the origin x-y. This was the clue for the workaround. The reason (probably) why it is working. On the device, if you use touch pressed and touch the position x=10 y=10 but your camera origin x=50 y=50. First action of the behaviour is miscalculating the location of the touched. Like this, I am not touching the actor and there is no actor in the place I touch. Instead touch pressed, mouse position inside is not calculating incorrectly. the same reason why it works properly when you touch pressed long enough, it recalculates where you touch. This is just a theory. It would be nice if we had a chance to look at the code. Hey, maybe knowing of a workaround will help GS put their finger on what the d*mn problem is. I got responses from the blue button saying they'll look into it. Now hoping they will come with a fix for this and all my problems . Just shows you what a senseless idea the 'blue button' is (or as I like to call it, the 'secret forum' ), if GameSalad staff engaged with their community, on the forums, information would dissemination much faster, as it stands either all 36 people (or however many are struggling with a particular issue) would have to individually contact GameSalad, and GameSalad would have to respond individually to all 36 . . . otherwise the only clue we'd have that they were even aware of the issue would be if someone (like yourself) is kind enough to post that you've made contact. 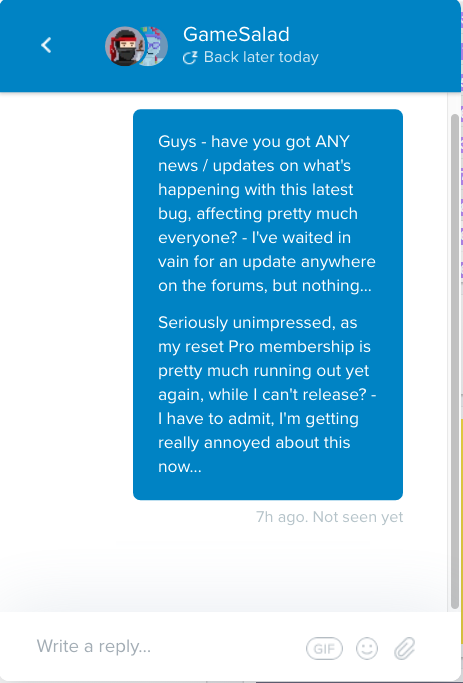 Who knows, maybe this issue - or some other issue someone else is having, maybe someone who doesn't post on the forums - was dealt with 3 months ago, or back in the summer, worked out in a long exchange of messages, via the blue button - but other people struggling with the same thing would never know, searching for it on the forums wouldn't bring up the contents of a blue button exchange, they'd probably just post a few times, then give up. There, I just did it for you! Considering all the neat tricks you know, can you figure out how to take a pin and pop that chat bubble... like a nasty pimple. Sorry, but if you want to discuss anything with me, from now on you will need to do it through my new chat bubble, that way no one can see what we are discussing, which is - for some reason - a good thing. "What's that? - I can't hear anything? (Especially from Japster or Socks, they're a disruptive influence)"
"Ahh... I think you said everything's A-OK?" "Back to working on the Wonderful Web Version then! - Yay!" @Japster With all the things we'v been through i'm surprised that you still have hope that they might fix anything. Look back into their history ios viewer bug / loading screen bug / stuttering with android bug, android viewer bug , chartboost change scene bug, Chartboost not showing ads bug. They only fix issues that might effect their revenue , bugs that really mess the engine. It takes them a month to realise that its a bug that needs to be sorted asap , and it takes them 2-4 months to actually fix it , cause it might get on hold for holidays/working on other important things such as the web version. I remember Hymloe's HTML5 bug threads that never got any response when he flooded the forums with all the issues. All they care about right now is getting gamesalad working in more schools , and maintaining GS for basic educational tasks. Anything that might not effect the student + the teacher can be left "on hold". The blue bubble will only get you one of these responses , they will ask you about the issue and test if it shows up , then the response will be " We will look into it and see what we can do " or "Sorry we were not able to reproduce the issue " and when you ask them after a month or 2 on what happened. "Can you send us a link to the bug report ? " or " Yeah the developing team will look into it once they sort other important issues , in the meantime you can do this workaround bla bla .. "
Then you will end up ranting in the forums again until you find a clever way to deal with the issue and sort it out yourself. As for the "native" engines, we'll be able to add certain types of features that don't >require a tool updates. For instance, Google Play Services support can be added (I'm >working on that now on the weekends). @Japster so for the short term we won't be working on the Windows engine port, mostly >because we need to get through the Google Play stuff, then loading screen bugs, and >then taking a look at scene loading times again. again a year later we didnt get to see anything. We got excited about it for nothing , they just like to give us something to keep us quiet until they are done with their plans and we forget about it , then when they respond we tell them how much of an awesome job they did , when they dont even deserve half of the praise. Don't bother waiting for them to fix anything . They might do it but most probably not. If it was an important issue to them and if they really cared about their product, they would have fixed it when pHghost mentioned it February 2017. I'm sad to say this but unfortunately i dont think 5 -6 forum members will matter to them cause at the end of the day , the web version is more important. @pHghost Or a half flush or a full flush button... down the gurgler it goes! We got excited about it for nothing , they just like to give us something to shut us up until they are done with their plans and we forget about it , then when they respond we tell them how much of an awesome job they did , when they dont even deserve half of the praise. Don't bother waiting for them to fix anything . They might do it but most probably not. If it was an important issue to them and if they really cared about their product, they would have fixed it when pHghost mentioned it February 2017. I'm sad to say this but unfortunately i dont think 5 -6 forum members will matter to them cause at the end of the day , the web version is more important. @adent42 @ForumNinja - fine guys, don't respond to any of these, pretend all of the posts (from everyone) aren't happening, you obviously do what the heck you want to do as always, and respond only when and if you want to (or NOT, as in, one single post about it, and just leave EVERYONE in the dark about whether they're just p***ing their subs and time away while core functionality is broken) - seems childish and unprofessional, but, if I'm being absolutely honest, as @Icebox mentions, we really ought to be used to this treatment and disrespect by now. I really want to stay and use GameSalad more. All the history, memories, great fun with it. But it's going downhill so badly. Today I took the first concrete step in another direction. I mean... I've been researching the alternatives out there for some time. I think that's just natural, having an overview of platforms. I bought some Unity plug-ins etc. over the years when they were discounted, but then they just sat in my account, dormant. I joined the Beta program for another tool that was getting a major Mac update, to see how it worked. Still, all of that was just research and an unlikely backup plan, nothing more. But I'll be honest. I took the first concrete step today and actually started watching in-depth tutorials for other tools.
. . . also, when moving from one platform to another not everyone announces it . . . . in fact as pHghost alludes to above it can be a gradual process, rather than a one off 'I'm leaving' event . . . . I bet the vast proportion of user traffic between platforms is pretty much silent . . . the people who actually announce that they are leaving - like Japster here in this thread - are usually doing so out of sheer frustration, in a last desperate attempt to reach out to GameSalad, to get GameSalad to engage, to attend to its community, to resolve ongoing issues . . . but for every Japster I suspect their are many more who share his frustrations but who simply move on without saying so . . . like pHghost I've also been taking the first concrete steps towards abandoning ship, I spend more time now with other game making software than GameSalad, so I'd number myself amongst those who have effectively left GameSalad, I'd also throw numerous other longterm users who rarely - if ever - post any more into that same group. I'd also thrown numerous other longterm users who rarely post any more into that same group. I think we should start our own Forum somewhere to keep in touch... so many in the community who have disappeared. Wonder what they're up to. Lol. To be fair this community seems to be the one thing about GS that has always worked!! !